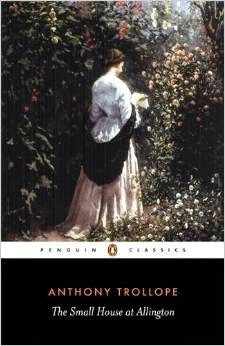 The Small House at Allington by Anthony Trollope is the fifth novel in the "Chronicles of Barsetshire" series. Perhaps wanting to inject variety into the series, this entry takes what is, for Trollope, a fairly dark, or at least grey, turn. This is another superb novel in the series. The story centers on the Dale family, who reside in the small house of the title. Mrs. Dale, a widow, resides there with her two daughters, Lilly and Bell. The plot revolves around the marital prospects of both. Each has what I would call a “good” suitor and a “bad” suitor. This is Trollope, and as usual the “good” suitors have some very negative character flaws and the “bad” suitors some good character traits. Lilly and her wooers are the primary focus of the plot, and they are more interesting characters than Bell and her suitors. Thus, I will concentrate on them. Both of Lilly’s love interests are complex and realistic literary creations. Adolphus Crosbie, her “bad” suitor, becomes engaged to Lilly for complex reasons, which include his desire for financial and social advancement. Despite the fact that he does begin to really fall in love with Lilly, when it becomes clear that Lilly’s uncle will not come up with the hoped for dowry, Crosbie reluctantly breaks off the engagement. This betrayal devastates Lilly, and her ensuing depression is a major factor in the story. He quickly becomes engaged to the shallow and materialistic Lady Alexandrina de Courcy. He spends the remainder of the novel regretting his decision, both before and after his marriage. As is typical with Trollope, there are numerous additional characters and subplots. Once again, there are so many areas that I could talk about that I could write an entire series of posts. This book is different from the previous entries in the series. Not only are there dark moments, but, unlike the other books, there is no really happy ending here. Though there are signs of hope, several of the characters end the story in a state just short of melancholy. I do want to focus a little on one extraordinary and important passage. It is the carriage ride that Alexandrina and Crosbie take from their wedding to their honeymoon lodgings. This is my fifth Trollope novel, and I find it to be perhaps the darkest passage that I have encountered thus far in my readings of the author. It is deeply affective and brilliantly written. It is clear that there is no affection between the two newlyweds despite some half-hearted attempts at tenderness by Crosbie. Personally, if I took a carriage ride with a pleasant person that I just met, I think that there would be more human connection involved. Making matters worse, Crosbie understands that he has made a terrible mistake, and it is Lilly who is on his mind. And as he seated himself opposite to Alexandrina, having properly tucked her up with all her bright-coloured trappings, he remembered that he had never in truth been alone with her before. He had danced with her frequently, and been left with her for a few minutes between the figures. He had flirted with her in crowded drawing-rooms, and had once found a moment at Courcy Castle to tell her that he was willing to marry her in spite of his engagement with Lilian Dale. But he had never walked with her for hours together….as he had walked with Lily. The tragedy here is that although Crosbie has done a terrible thing by abandoning Lilly, he has a lot of substance to him. He is intelligent and cultured, and he can be thoughtful and sensitive. He had never talked to her about government, and politics, and books, nor had she talked to him of poetry, of religion, and of the little duties and comforts of life. He had known the Lady Alexandrina for the last six or seven years; but he had never known her,— perhaps never would know her,— as he had learned to know Lily Dale within the space of two months… It was in this that Crosbie's failure had been so grievous,— that he had seen and approved the better course, but had chosen for himself to walk in that which was worse. Even though he has acted abominably, these thoughts, as well as the mood that Trollope creates, manifest upon Crosbie’s wedding day and reach a very high level of pathos. The scene goes on for multiple pages. I find it to be a gem, and it alone would make the book worth reading. As in every other book that I have read in this series, there are a lot of other good reasons to read this novel. It rises to the level of Trollope’s usual typical high quality. There are so many great characters and interactions worth noting, including the incredibly complex relationship between the Dale women and Mrs. Dale’s brother-in-law, The Squire of Allington. What I would describe as a grey ending fits in well both with the themes and with the characters. In my opinion, the sad outcomes raise this novel up a couple notches on the aesthetic scale. I still think that Barchester Towers is the best in the series so far, but this one comes in a close second for me. Although this is the fifth book in the series, it can be read as standalone. Characters from the other books take on small to moderately important parts here. I have just one more book to read in the Chronicles of Barsetshire" series, The Last Chronicle of Barset . I cannot wait to delve into that one! 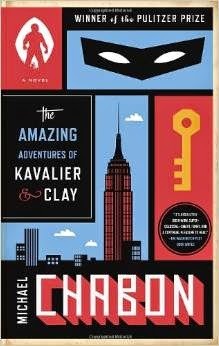 The Amazing Adventures of Kavalier & Clay, written by Michael Chabon, won Pulitzer Prize for Fiction in 2001. It is the story of two young and talented comic book writers and artists. The novel spans from the late 1930s, which was the beginning of the comic book era, through the 1950s. Joe Kavalier is a Jewish refugee from Prague. He is intent on rescuing his family, which has remained in Europe. He is also determined to take revenge upon all Germans. Sammy Clay is Joe’s American cousin. As Sammy passes beyond adolescence, he hesitantly comes to the realization that he is, in our current terminology, a gay man. As the story develops, he attempts to come to grips with this fact, as well as the ensuing related social and legal repressions. Rosa Saks is an artist who is Joe’s bohemian girlfriend. She plays an integral part in the plot as she attempts to assist Joe in bringing his younger brother to safety into the United States. She is later heavily involved in the lives of both male protagonists. There are so many plot elements of interest. Much of the story concerns itself with the early American comic book industry. Major parts also include a look into the world of magicians and escape artists. There are cameos by real historic figures, such as Salvador Dalí and Sam Winston. A few chapters take place in the fictitious comic book world. I must confess that I have never been a fan of comic books, including some of the newer ones that I have been told have strong artistic merit. Nevertheless I found this book riveting and worthwhile. A Google search reveals that it is no secret that one of the main themes of the novel is people’s tendency to try to escape. Characters attempt to escape the Nazi’s, responsibilities, family, boredom, etc. Not only is the entire concept of the superhero shown to be escapism, but Joe and Sammy’s greatest creation is a superhero known as The Escapist. If escape is a main theme here, then the great puzzle, it seems to me, is: just what specifically is Chabon saying about people’s tendency to attempt escape? I think that the author is trying to show that this human tendency is complex and yields no easy truths. The newspaper articles that Joe had read about the upcoming Senate investigation into comic books always cited “escapism” among the litany of injurious consequences of their reading, and dwelled on the pernicious effect, on young minds, of satisfying the desire to escape. As if there could be any more noble or necessary service in life. Yet, in several instances, characters’ escape attempts from life situations lead to horrendous disaster. At one point, Joe is on the eve of proposing marriage to Rosa. The couple is in love and a relatively happy life together seems a real possibility. At this moment, Joe is informed of the death of his young brother Thomas, who himself was in the process of attempting escape from Nazi occupied Europe. Thomas is the victim of a German U-Boat. Upon hearing the news, Joe takes drastic measures to escape from reality. He abandons both Rosa and Sammy. He joins the navy and refuses to even read Rosa’s or anyone else’s letters. His escape is symbolically complete when the navy assigns him to a super isolated base in the wilderness of Antarctica. Though Joe does not know it, Rosa is pregnant with his child. This escape attempt is enormously damaging to the lives of multiple people. There are a lot more complex permutations on the theme of escape. These include Sammy’s escape from the reality of his sexuality and emotions by spurning a man that he is in love with and subsequently entering into an ill-conceived marriage with Rosa. Joe, for his part, is an accomplished escape artist along the lines of Harry Houdini. Numerous other examples, as well as the examination of those examples, abound. As noted by many others who read this work, I agree that in terms of the plot, the last one third is not as engaging as the earlier parts. I found this to only be a minor flaw as in terms of theme and character development, Chabon’s work is strong throughout. There is so much going on in this book beyond the central theme of escape. The history of the comic book industry is examined in some depth, as are its artistic and psychological underpinnings. The novel has several compelling characters. The story contains social commentary on the plight of gay men. It is often very funny as well as tragic. Chabon’s prose is accessible and entertaining and filled with unusual and rare words. This is both a fun and meaningful book. I highly recommend picking up a later printing of the novel. Chabon has included some related short stories in these editions. These include an epilogue that takes place in the 1980s that fills the reader in as to how the lives of the protagonists panned out after the close of the novel. Some general thoughts on Feminism and the issue of violence directed at women, please see my commentary here. No Turning Back: The History of Feminism and the Future of Women by Estelle Freedman is a comprehensive history of the intellectual and social movement called Feminism. The author is a Professor in U.S. History at Stanford University and has written a great number of books relating to feminism and gender issues. This is an extensive history of feminism as well as the social history of women that stretches from pre - civilization through the present. It is a perfect book both for anyone who knows little about the issues, or for someone like myself, who has a moderate understanding of feminist and women’s social history. I do suspect however, that someone who already has a strong and detailed understanding of both the history, thought systems, issues and controversies relating to these topics, might find this book a little too rudimentary and basic. As I was looking for a fairly comprehensive introduction to the subject, this book was perfect to start off my readings. Unsurprising, the work displays a pro – feminist bias. However, this bias is not overwhelming or strident. I do think that this is an important book. When I searched for such a comprehensive history the choices seemed sparse. This is only one of a couple of contemporary works that fits this niche. Freedman addresses this lack of all encompassing books on the subject herself. Several years ago a woman whom I admire asked me to recommend one book that she could read to learn about feminist scholarship. At first it seemed like an easy enough request. I had been reading widely in the interdisciplinary women’s studies literature since 1970, the year I entered graduate school in U.S. history and first defined myself as a feminist. Now I taught a course called Introduction to Feminist Studies and chaired the Program in Feminist Studies at Stanford University. As I began to name my favorite books, though, I realized that no one selection fit the bill. My choices tended to be studies of women’s history or important theoretical works in other disciplines that would not necessarily appeal to a nonacademic reader. Neither a textbook nor an anthology of short essays, such as those I assign in class, would do the trick either. I eliminated one possibility after another until I realized that no single book brought together the interdisciplinary literature that the past generation of feminist scholars has produced. Unable to fulfill her request, I jokingly said that I would have to write that book myself. One thing that I like about this book is how it successfully touches upon so many issues relating to feminism and women’s issues. Estelle covers general history, sociology, anthropology, violence, war reproductive issues, labor, art and aesthetics, to just name a few areas. She covers various theories, concepts and trends relating feminist thought systems including multiple feminisms, intersectional feminism, radical feminism, the three waves of feminism, etc. There are so many subtopics of interest that I can discuss here. This makes it difficult to focus on any one area. For instance, one of hundreds of such subtopics surveyed here, but one the that I found to be of particular interest, was Friedman’s exploration of women who have been great writers and why history has not given us more of them. Several aspects of this issue are explored, including lack of opportunity as well as society ignoring talented women. Estelle also mentions and builds upon Tillie Olsen’s proposition that prior to the twentieth century, women who were childless were more likely to produce great art. Though the argument is fascinating and in some ways convincing, I would need to know a lot more in order to weigh in with an intelligent opinion on this issue. A less esoteric and arguably more important point that Freedman makes is the curios phenomenon of public opinion, which seems to strongly support most of the basic precepts of feminism, yet fails to identify themselves as supporters of Feminism. A generation of Western women came of age influenced by feminism to expect equal opportunities. The majority of this generation often proclaimed, “I’m not a feminist, but . . . ,” even as they insisted on equal pay, sexual and reproductive choice, parental leave, and political representation. The children they raised, both male and female, grew up influenced by these feminist expectations but not necessarily comfortable with the term. Freedman spends a lot of pages exploring this very important puzzle. My opinion on this matter is that opponents of feminism have succeeded in unfairly twisting and demonizing the meaning of the word. One flaw in this work, at least for me, is that Freedman touches on a lot of trends and theories that need more exploration then is provided. Though this is a general history, I think that that the book needed to be longer as particular threads should have been expanded. Regular readers of this blog do know however, that as someone addicted to surveying facts and ideas, I often complain that non fiction books should be longer. Why should this book appeal to both men and women? Ironically Freedman does not address the global and universal impact of feminism as in as much detail as I would have liked. I believe that the empowerment of women has been one of the most profoundly important trends in human history. Furthermore as the trend continues, it will continue to have an enormous impact upon humanity. Thus anyone who wants to understand history, society, politics, as well as an entire host of other issues, would do well do understand Feminism and its history. This book is a really good place to start.